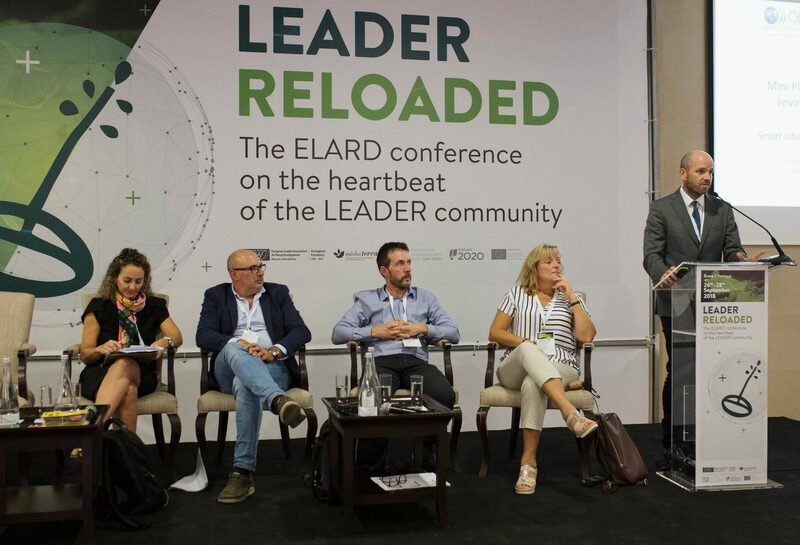 (8 Oct 2018) – ECOLISE executive director, Eamon O’Hara (centre, above), recently participated in the LEADER Reloaded conference in Portugal, where he underlined the need to put climate and transition centre stage in the next round of the EU’s LEADER programme for rural development. Organised by ELARD (the European LEADER Association for Rural Development), the conference brought together LEADER representatives from across Europe, together with EU officials, to discuss future challenges and how these could best be addressed in the next round of EU programming (2021-2027). During his presentation, Eamon drew attention to the climate challenge and to the latest science, which suggests that the earth is warming faster than previously predicted, and that the goal agreed by governments of keeping the temperature increase to less than 2°C is no longer considered safe and could lead to devastating impacts. Scientists now emphatically warn that the temperature increase must be kept to below 1.5°C to avoid the run-away climate change. The window of opportunity for achieving this is closing rapidly. Global carbon emissions need to stabilise by 2020 and then fall dramatically, to net zero emissions by 2050. Achieving this requires a complete transformation of our economic system, but Eamon pointed to examples that show this transformation is already underway, driven mainly by innovation at grassroots level. Citizen and community-led initiatives in areas such as energy, food, mobility and construction are demonstrating that it is possible to live happy and fulfilling lives while also respecting social and ecological boundaries. The challenge now is to amplify this response and Eamon called on LEADER representatives to show leadership at local level; to engage citizens and communities in conversations on how to respond to the climate challenge and the opportunities this presents to reinvent rural and urban areas. LEADER, he said, was ideally placed to help empower communities, to build capacity, facilitate access to funding and resources, and support networking and collaboration. Looking to the next round of programming, Eamon encouraged LEADER representatives at local level to diversify their partnerships and decision making structures, to put climate and transition at the centre of their local strategies, and to prioritise village/community transition plans and projects. At national and EU level, he said the onus was on policy makers to create a framework (of legislative and technical assistance) to support community-led climate action and to shift success metrics away from short term economic goals to a broader set of indicators that reflected the need for a more holistic approach.